The Shineray XY250GY-2, available from Zuma Power Products , is a highly advanced dirt bike that boasts the first 4-valve DOHC engine to be made in China with a six speed transmission and a 9,500 rpm redline. The chassis on the Shineray XY250GY-2 dirt bike is all new manganese rectangular tube and box section, and a beautifully crafted alloy rear swing arm with precision welds at every point. 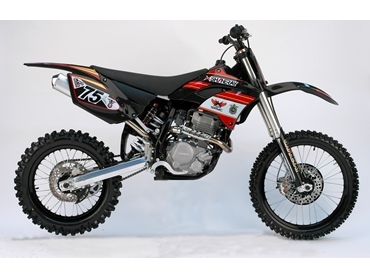 FASTACE suspension Taiwan manufacture the front forks and rear shock absorber on these dirt bikes, which both have compression and rebound adjustment, performing every bit as good as European suspension. The drive line points on these dirt bikes are all designed for strength, right down to light-weight hollow axles and purpose built wheels. Other key features of the Shineray XY250GY-2 dirt bike include electric start and a thematically water-cooled engine. The Shineray XY250GY-2 dirt bike is made for the discerning customer who wants performance and handling at half the price of other major brands.